Blake Coleman, set to make his RedHawk debut this Fall, has been named the USHL Player of the Year, as well as Forward of the Year. 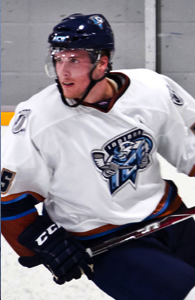 Having spent the last season and a half with the Indiana Ice, he led the league with a total of 92 points, 38 of those being goals, in 59 regular season games. The release, which can be read in full here also says that Coleman’s plus-52 rating on record since the USHL became a Tier 1 league in 2002. The Texan Coleman is ranked #198 on the list of North American skaters heading into this year’s NHL draft in June, which most likely translates into a late-round pick, if at all. The incoming crop of freshman looks to be impressive thus far and Coleman’s monster season with the Ice has only helped solidify his case as one of the most promising to wear a RedHawks sweater in recent years. 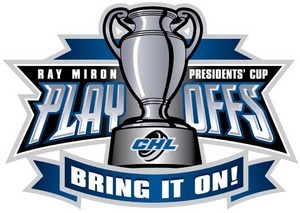 There are several former RedHawks in the playoffs at the various stages of professional hockey. Here now is an updated look at their performance thus far. 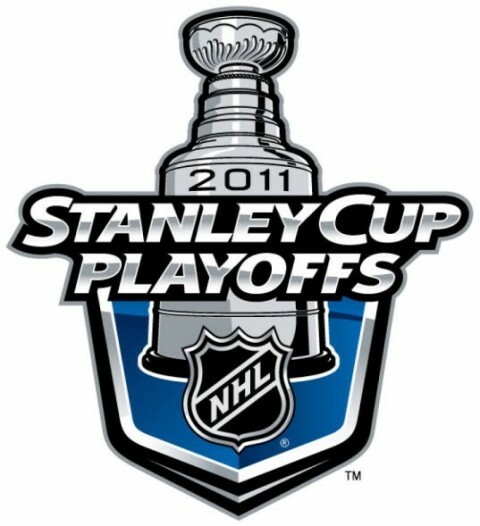 – The San Jose Sharks defeated the LA Kings in overtime on Monday night to win the best of 7 series 4-2. Miami fans had a keen interest in this game, as both Alec Martinez (LA) and Dan Boyle (SJ) were looking to advance to the next round of the Stanley Cup Playoffs. In 6 games of the series, Martinez had 0-1-1 (an assist in Game 6) and drew 2 penalty minutes. Boyle, also in 6 games, registered 0-3-3 and 4 penalty minutes. The Sharks are awaiting the conclusion of the Vancouver/Chicago series to find out who they’ll play next. – Jarod Palmer and his Houston Aeros are in the second round of the Calder Cup Playoffs after sweeping the Peoria Rivermen in round one. Palmer played all four games and notched one goal and one assist. Game one of the second round series against Milwaukee is on Friday night. – Things didn’t go well for former Miami netminder Jeff Zatkoff, as the Manchester Monarchs couldn’t make it past the first round, losing to the Binghampton Senators in seven games. Zatkoff finished the 2011 playoffs with a 1-3 record and a 3.80 GAA. Pat Cannone was not with the Senators for the first round series. – Justin Mercier and the Lake Erie Monsters fell to the Manitoba Moose in 7 games of the opening round of the quest for the Calder Cup. Mercier played well, adding two clutch goals in 64 seconds in game 4 of the series and finishing with 3 goals, 2 assists, for a total of 5 points. The Monsters couldn’t cash in on a 3-1 series lead. – In the CHL, the Allen Americans and former RedHawks Nino Musitelli and _ are moving right along en route to a championship celebration. In 8 games, Musitelli has 2-4-6; the Berry Conference Finals are set to begin Friday night. Allen will take on the Bossier-Shreveport Mudbugs, with the winner earning a trip to play for the President’s Cup against either Rapid City or Colorado. Musitelli has played VERY well in two seasons with Allen. One has to wonder if a step up is in line next season. 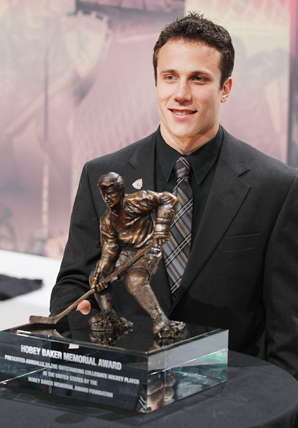 St. Paul, Minn. – Earlier tonight, Miami’s Andy Miele became the 31st winner of the Hobey Baker Memorial Award honoring the nation’s best college hockey player. In doing so, Miele capped the greatest individual season in Miami hockey history by winning the CCHA and NCAA scoring races, the CCHA Player of the Year and tournament MVP awards, was named first team All-America and finally, the Hobey Baker. It wasn’t quite “The Decision”, version 2, ala LeBron James, but former RedHawk and current Hobey Baker finalist Andy Miele has made his choice and signed with…the Phoenix Coyotes. Several teams had reportedly been working to sign the Grosse Point Woods, MI native, but sources say Miele’s final five teams included Anaheim, Dallas, Los Angeles, Phoenix, and New Jersey. His 71 points and 47 assists this season were tops in Division I hockey and Miele became the first Miami player to crack the 60-point mark since Randy Robitaille accomplished the feat during the 1996-97 season. He was also named the RBC Player of the Year and received First-Team All-CCHA Honors.